Yes, we know it’s January and your fat-trimming resolutions have yet to melt away with the first snowfall. But there will come a time when you crave a burger. Here, five of the best new arrivals, distinguished either by compelling origin story or unique cooking method, and found where you might least expect them. This ramen(-shop) burger isn’t sandwiched between two piles of fried noodles but rather served on a housemade Asian-style potato bun. Into that fluffy cradle goes eight ounces of short-rib meat mingled with dry-aged beef fat. Mu’s Joshua Smookler cooks the patty over hardwood charcoal in an oddball oven imported from Croatia expressly for this purpose; tops it with Taleggio, potato sticks, and — like at one of its inspirations, Minetta Tavern — deeply caramelized onions; and won’t serve it one degree past medium rare. It began, like some of the best things at restaurants often do, as a staff meal, then became a verbal special as Franco-American as its gastrothèque setting. Inspired by the Spotted Pig’s Roquefort behemoth but about a third the size, this superb little flavor bomb is larded with the hand-chopped trimmings from steak-tartare prep, expertly griddled, crowned with blue cheese, and served on a perfectly pliant square of focaccia with a mountain of matchstick fries. 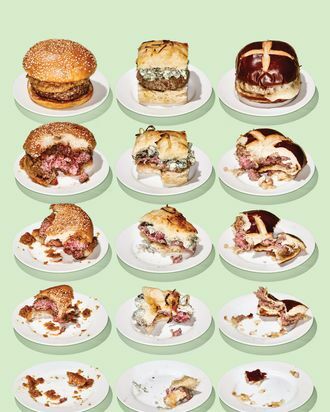 When superstar chefs cave under pressure and finally give their public what it wants (i.e., burgers), they tend to overdo it with loony-bin toppings and fancy fromage. Not so Masa Takayama, whose first foray into the world of Wimpie has brought us two surprisingly stripped-down takes (one lamb, one beef, both available only from 5 to 6 p.m., and soon for lunch). The beef burger in particular, with its seal of melted Cheddar and uncharacteristically squishy and cohesive pretzel bun, is a minimalist marvel. Notable technique, too: It’s cooked in a medieval-looking contraption the chef designed, with internal spikes that pierce the meat but preserve the juices, that might be the greatest innovation in burger cookery since Louis’ Lunch’s vertical cast-iron patty broiler. You can’t describe a burger condiment on your menu as requiring 22 steps without arousing the curiosity of critics and provoking debate. Thus we have Pete Wells taking a pro 22-step-tomato stance in the Times (“The tomato … helps the burger so much that it becomes the whole point”), versus Shauna Lyon in The New Yorker who recommends removing the offending fruit like a bouncer ejecting a drunken hooligan from a bar. The truth lies somewhere in the middle: If you must sully a juicy puck of pedigree beef, you could do a lot worse than this soy-and-miso-marinated, slow-cooked tomato, which adds just the right measure of sweetness and acidity without compromising the burger’s structural integrity or flavor balance. Just when you thought that the watchword in burger cookery these days was simplicity, along comes Pheasant’s Euro Burger: house-ground beef-and-pork patty, melted provolone, sour pickles, special sauce, and two pungent planks of kielbasa from a nearby Polish butcher on a Bien Cuit bun, the whole shebang smooshed on a panini press. In other words, here is a hamburger that thinks it’s a Cuban sandwich. Against the odds, it works. “Sounds terrifically wrong, tastes incredibly right” about sums it up.